The opening weeks of 2019 have been an interesting time for those who work to bring the Extraordinary Form of the Roman Rite to places where it hasn’t been seen in half a century. Two remarkable events of this sort took place recently, one at the United States Military Academy at West Point, and one in the cathedral church of the diocese of Bridgeport, Connecticut. Due to the efforts of Captain Randy Shed, an officer stationed at West Point, a group of clergy, servers and singers trekked to the Catholic Chapel at the famous landmark to celebrate an Epiphanytide ferial Mass on January 11. The Rev. 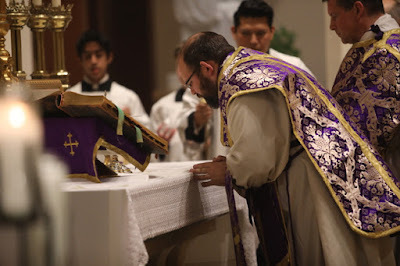 Donald Kloster, parochial vicar of St Mary’s Church in Norwalk, Connecticut, along with Fr Michael Novajosky as deacon, and Fr Tim Iannacone as sub-deacon, celebrated the Mass, accompanied by more than a dozen servers and masters of ceremonies. The Viri Galilaei of St Mary’s, a lay group of men who sing Mass and Vespers each Wednesday, was under their director, David Hughes, organist and choirmaster of the parish. More than 120 people attended the mass, including cadets, officers and their families, and people from the surrounding communities. The Rev. (Major) Sean Magnuson, rector of the chapel, gave permission for the Mass, followed by a reception in the parish hall; this was the first such event at the parish in more than a half-century, according to parishioners. Eleven days later, Fr Novajosky, the rector of St Augustin’s Cathedral in Bridgeport and pastor of the cathedral parish (which includes St Patrick’s Church), celebrated a votive Missa pro Pace at the Cathedral, with more than 200 people attending. The votive mass was celebrated on the anniversary of the Roe v. Wade Supreme Court decision and asked for peace in the diocese, the Church, and the world and an end to abortion. It was followed by Benediction of the Blessed Sacrament. 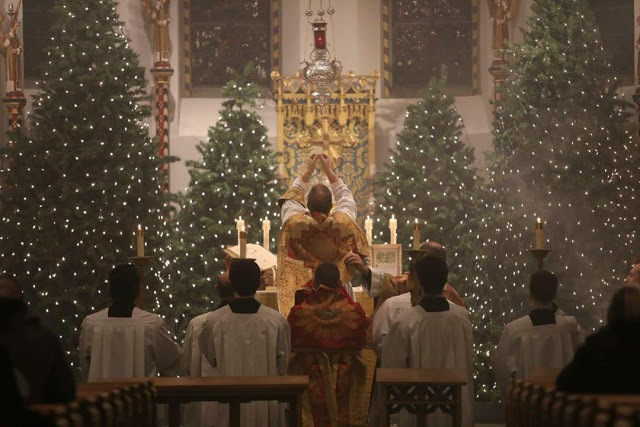 Fr Novajosky has been celebrating regularly scheduled daily masses at St Patrick’s in the Extraordinary Form, and solemn celebrations at least monthly, such as Immaculate Conception and the Octave Day of Christmas. With the approbation of Bishop Frank Caggiano, the Mass on January 22 was the first for the cathedral since the reforms following the Second Vatican Council. Ministers were the Revs. Greg Markey (deacon) and Richard Cipolla (sub-deacon). The parish CCD classes attended, as part of an effort to expose them to the older rites. Fr. Novajosky spent class time explaining the prayers and ceremonies of the rite prior to the celebration. The congregation included people from all over the diocese who heard about the event. Servers from St Patrick’s, the Cathedral and some from St. Mary’s aided in the rites. In the coming weeks Fr Novajosky has planned Candlemas at St Patrick’s on Febuary 2, and the Patronal Feast of the parish on March 17.